New wind infrastructure projects in Texas are looking to boost the total capacity to around 20,000 MW. 20,000 MW is almost a third of Australia’s entire grid. Australia’s total installed wind capacity is under 3000MW. This perspective highlights the potential that we have in Australia to boost renewables influence on the grid and have cleaner energy. The original post was found on The Equation. It can be found here. Press reports of Texas completing new transmission lines for wind describe an energy boom with a difference — this is carbon-free wind energy. The grid operator in Texas, ERCOT, says agreements are already done for 7,500 MW of new wind power, most of which will be using the new transmission lines by 2016. That will put installed Texas wind around 20,000 MW. There are 15 U.S. states with 1,000 MW or more, but Texas wind is already twice as big as the next largest wind states, California and Iowa. For size comparison, ERCOT’s winter demand for electricity can hit 57,000 MW, and summer demand peaks upwards of 68,000 MW. The energy from wind varies with the weather and time of day, as does the electric demand. Line these up, and see how much has wind actually contributed: on Christmas Day, 2013, wind supplied 26 percent of ERCOT’s electricity use. 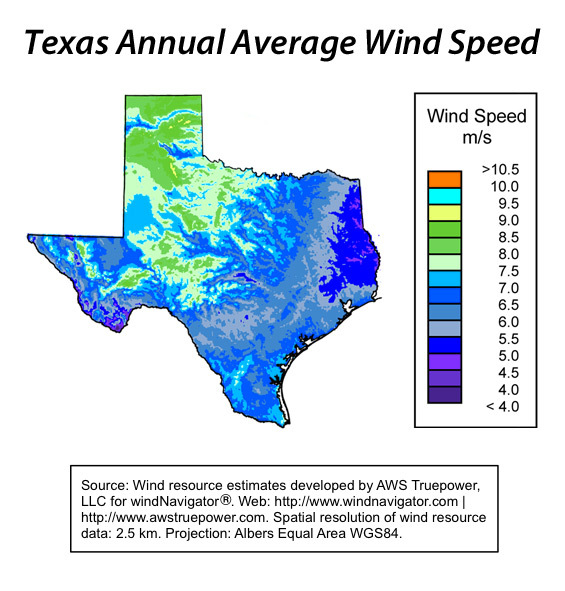 On January 29, 2013, Texas wind power produced 32 percent of total electricity needed. This is a great story of collective action, mandated by the Texas state legislature. It all started with the Texas RPS law, signed by Governor Bush. 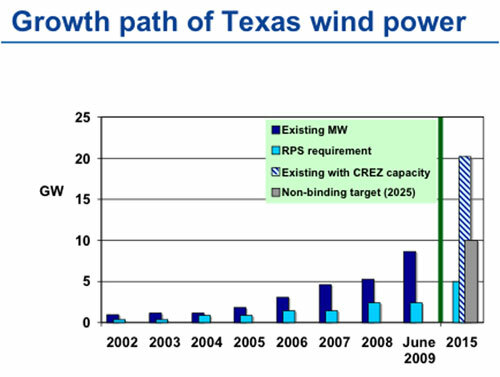 Once Texans found wind could be profitable, the legislature raised the RPS and set out this transmission planning-and-building requirement known as CREZ. Eight years in the making, from designing the transmission to completion. During these eight years, many advocacy efforts tried to describe how to duplicate this in other regions. Texas does all its electricity policy and planning in one city, Austin. There isn’t any other state involved, and the electricity sector is largely exempt from Federal energy market rules. These unique circumstances have not been available to another transmission-for-wind effort. ERCOT is one of several regional power grid operators, also known as RTOs or ISOs. These organizations constantly match the power supply with the power demand, and manage the variability of the wind farms, as well as the sudden trips or scheduling problems of all other power plants. ERCOT and the other ISOs are responsible for the reliability of the grid. This requires that they plan for changes that might be coming. Most of the ISOs have completed studies examining how the grid in each region will handle high levels of renewables. When there were only 2,508 MW of wind farms in Texas, ERCOT studied how the new transmission and the added wind energy would create lower prices in the electricity market. Other regions have made studies to anticipate the impacts, and needs, to accommodate 10, 20, and 30 percent new renewable energy. PJM, the grid operator for 13 states and D.C. is due to release its report. That report shows using renewable energy can substantially reduce air pollution, including CO2. For folks that are interested in compliance with EPA 111(d) regulations, the PJM report should be useful. I’ll be writing about that next week.